Domenico Ceccarossi sought to elevate horn playing to the level of perfection attained by violinists, pianists, and singers. His recordings, writings, and compositions confirm that he succeeded in his goal, all the more remarkable in that he lived through two world wars, economic depression, and Mussolini. Ceccarossi was born in 1910 and grew up in a small village in central Italy, where he played with local bands. 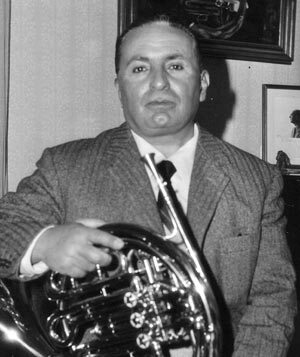 He joined the Radio Orchestra of Milan at age 21, moved a few years later to the Academia di S. Cecilia Orchestra in Rome, and in 1944 was appointed solo horn with Radiotelevisione Italiana, where he stayed until 1970. He continued to concertize until 1982, after which he continued to teach, write, and edit. Ceccarossi taught at the Conservatories of both Rome and Pesaro from 1951. Although he was self-taught, he was effective as a teacher and students came to him from around the world. Ceccarossi recorded much of the horn literature, almost all made from start to finish without dubbing, and many are live performances. If his tonguing seems heavy and his tone thin, this may be attributed to the recording environment; however, he never missed a note and his high register sings out clearly. RCA recorded The Art of Domenico Ceccarossi under more favorable conditions, and this recording stands as an excellent representation of his technical and musical prowess. Harold Meek observed that Ceccarossi's technique never fails to serve the music. Ceccarossi's style inspired many composers: nine concertos have been dedicated to him, and composers wrote a score of sonatas and other compositions. Elliott Carter mentioned learning the possibilities of horn technique from Ceccarossi while living in Rome in the 1950s. Ceccarossi especially expanded the literature for horn, voice, and piano. He founded Trio Ceccarossi in 1958 with his wife, soprano Jolanda Colizza Ceccarossi, and pianist Loredana Franceschini, and they toured Europe for many years, their repertoire eventually growing to over thirty pieces, twelve written for them. Ceccarossi, along with the mayor of Lanciano (on the eastern coast of Italy), established a summertime musical event in the Lanciano Estate Musicale Frentana that has continued since 1972 as an orchestral training course and instrumental and vocal seminar. In his article on Phrasing in the November 1976 issue of The Horn Call, Ceccarossi outlines his interpretation of phrasing in Mozart and Strauss, and especially the impact of Gumpert and Kling on modern phrasing. He points to the violin as his inspiration and to his own recordings, writings, and compositions as evidence of how the horn can achieve a cantabile style with lightness, and virtuosity with coloristic possibilities, "through which one can achieve a concert level so many other wind instruments have attained." Ceccarossi method book, École Compléte du Cor, comprises four volumes. He also composed Dix Caprices (intended to put the horn on the same level as the Caprices of Paganini; that is, arrive at that technical virtuosity) and edited many pieces in the horn repertoire in light of his standards of interpretation. Ceccarossi was elected an IHS Honorary Member in 1982. An interview appears in the April 1972 issue of The Horn Call, and a tribute in the February 2000 issue. Photo courtesy of Pete Exline.